Combine cidar juice and the orange juice concentrate in a container and refrigerate it until its time to serve. Right before serving it, pour the punch into the punch bowl and add chilled ginger ale to it and then add orange and apple slices to garnish. Heat 2 cups of milk in a saucepan, until steamy hot. Its going to take about 5-7 mins. Once the milk begins steaming, pour in the hot chocolate mix. Continue to cook until hot chocolate reaches desired temperature. Make sure you don’t let it boil. Now take it off heat and add the peppermint schnapps, taste it if required and if it feels like that, then add a little more schnapps. Now pour the mixture into glasses for your friends and family. Garnish it with sprinkles and whipped cream. This cocktail is one of the easiest as well as one of the best cocktails to prepare for your holiday party. Mix lime juice, sugar and mint leaves in a glass until the leaves break down. Fill half the glass with ice. Mix the white rum, coconut rum and coconut milk in a Blender and blend until smooth. Garnish it with mint, pomegranate and sparkling water. Serve with ice on top. This is the most fun and one of people’s favourite festive ever. Mix together Chocolate Syrup, Kahlúa, Ginger, molasses, vanilla, and vodka. Shake the mix until its all combined. Add some ice on top and shake it again. This is going to make 4 glasses. Add some whipped cream and garnish with all you can think of. Serve to all. 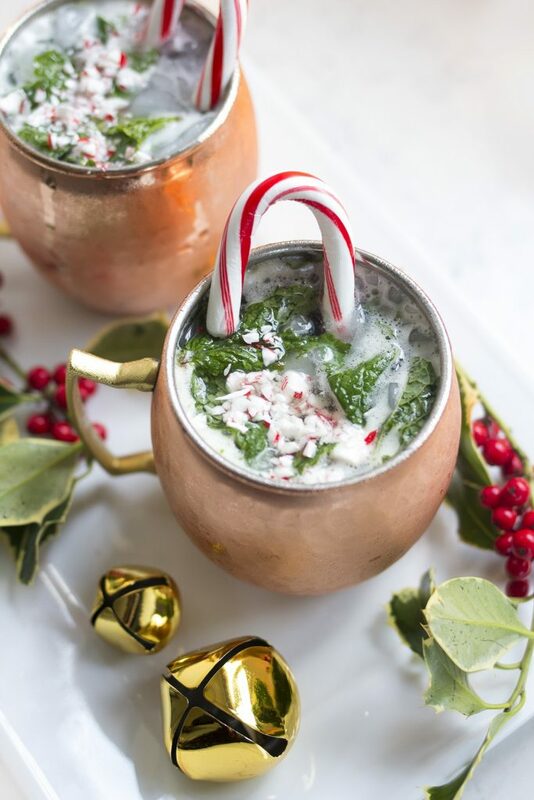 This is a holiday drink that is just a version of the Classic and traditional Moscow Mule that is made with candy canes and mint for an amazing festive flavour. Fill the Mule mug with a handful of mint and crushed ice. Mix with lime juice and vodka. Add ginger beer for garnishing. Sprinkle Candy Cane on top and Serve to all. This winter, get all warmed up with a glass of Sangria filled with amazing fruits and a hint of rosemary. Mix fruit, cider and wine in a big container. Add on ice and top with a little bit of rosemary. Make this quick cocktail within 10 minutes. Pour honey syrup and whiskey together in a shaker and shake until it get mixed up well. Add a good amount of ice and let it chill for a few minutes. Don’t let the mixture sit in ice for much time as it may result the mixture in getting all watered down. Let it be refrigerated for a while. Right before you are about to serve it, add some prosecco to garnish the drink along with rosemary, just 1/2 sprig of it. Serve to all and enjoy. This is nothing but the festive version of the amazing piña colada which is going to add to the flavour of your holiday party. Put shredded coconut on a plate. Take a glass and wet its rim with any simple syrup. Now dab the top of the glass onto the plate of the shredded coconut and let it be applied on the rim at each section. Pour pineapple juice, vodka, coconut cream and add some ice in a blender. Blend until its mixed all well. Now pour the winter cocktail into the pre prepared glass and serve it immediately to all your loved ones. A very quick and simple recipe for a yummy christmas coffee drink that is going to amaze you with its taste. You now have something different to serve to your family and friends other than regular coffee this festive season. Mix strong coffee and both the liqueurs in a clean glass. Mix and stir the drink and garnish with fresh whipped cream. Add grated chocolate to top. Serve the drink hot or or icy and enjoy. This delicious cocktail is absolutely terrific and is loved by all when served. Try it for yourself. Put the chocolate milk in a shaker and mix the liqueurs and shake to mix. Mix and stir till all is combined well. Put it in a glass and serve to all your loved ones. Its an amazing booze that has enough spice and is very simple to make. Take a glass and wet its rim and dip it into brown sugar gently. Pour vodka, apple juice, whiskey and ground cinnamon altogether with ice. Mix the contents by shaking the container and then gently pour it into your pre prepared glass. Serve it icy cool with a cinnamon stick to top with. 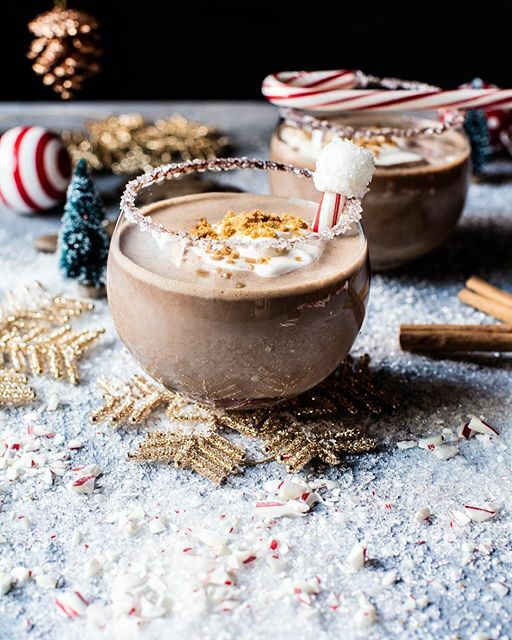 This wonderful recipe for the Winter Wonderland Cocktail is going to get you all cheered up after you try this with your friends and family. 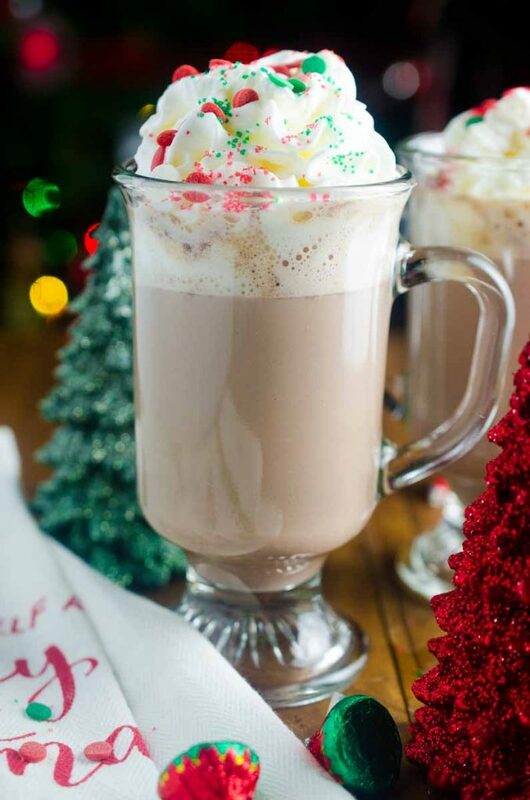 Take a Shaker and pour cocoa creme, vanilla vodka and coconut cream in it. Shake until its all mixed well. Then pour the mix into glasses filled with ice and serve it cool. A Sangria made from red wine specially for winters and our very own holiday season can get all lit by the mere presence of this special cocktail. Pour the wine, orange juice, pomegranate juice, and brandy in a jar and stir it all well. Add pomegranate arils, orange, cinnamon ad cranberries. Let it refrigerate for two hours. Once ready, serve it cool with ice in the glasses. These are one of those selected cocktails that if once tasted by someone, can never be forgotten. 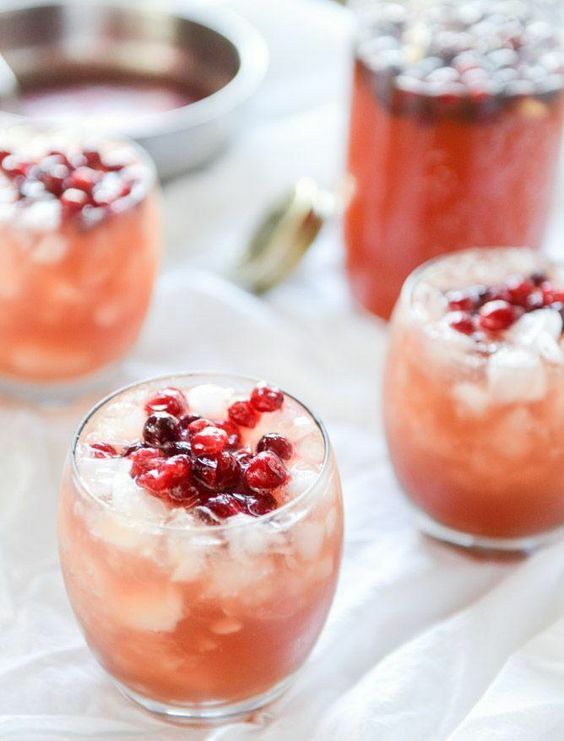 These cocktails look beautiful when being served in glasses and are suggested mostly for couples on their dates, but they are also a great choice for your very own christmas party. Its gonna add to the look of your dinner table as well as its taste is gonna get everyone all swirled up. Put the blackberries, sugar and water on a small pan and let them cook for 15-20 minutes. Let it come to boiling point, and then get down to simmer. This is gonna make the blackberries go softer and bright in colour and also there will be a purple and pink syrup formed on the pan. Take it off the heat and let the blackberries drain out of the pan and keep the syrup safely in a different bowl. Keep both, syrup and blackberries, to cool down and let them rest. Once its all cool, take the bowl of syrup and pour approximately 4 tbsp of it into each glass of cocktail. Top it with blackberries and rosemary. Its basically cranberry juice with a big amazing twist of tart and sweet in it that makes this drink so special. Take All Ingredients in a jar and stir them altogether till they get mixed up well. Rim the glasses with sugar or salt according to tastes and preferences. Serve it over cubes of ice. Forget about the Hot chocolate that you often buy from stores, cause this recipe right here is gonna get you a far better and way more delicious hot chocolate than you would have ever had. And it easy to cook too. So let’s get started. Put cinnamon, cocoa powder, sugar, nutmeg and milk in a saucepan and let it cook at medium heat temperature. Keep stirring. Let it cook for 2-3 minutes, then remove it away from heat and add Kahlúa. Serve it hot with marshmallows, chocolate syrup and salted caramel as per taste. 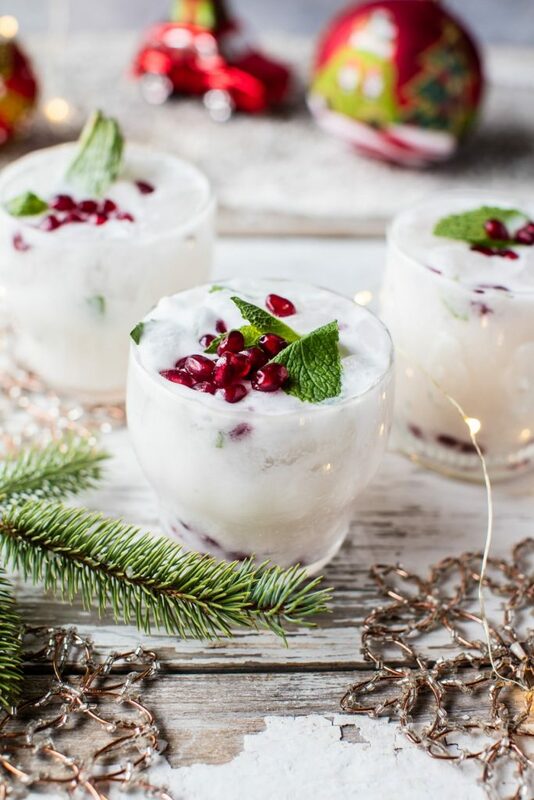 All these Mouth watering recipes for Christmas Cocktails are the best out of all chosen by us. So just get on with making these cocktails for yourselves and call all your friends and your dear ones to your place and surprise them with these cocktails that are gonna be made beautifully by you.